Edmund de la Pole was the son of John de la Pole, 2nd Duke of Suffolk and his wife Elizabeth of York, younger sister of King Edward IV and older sister of King Richard III. 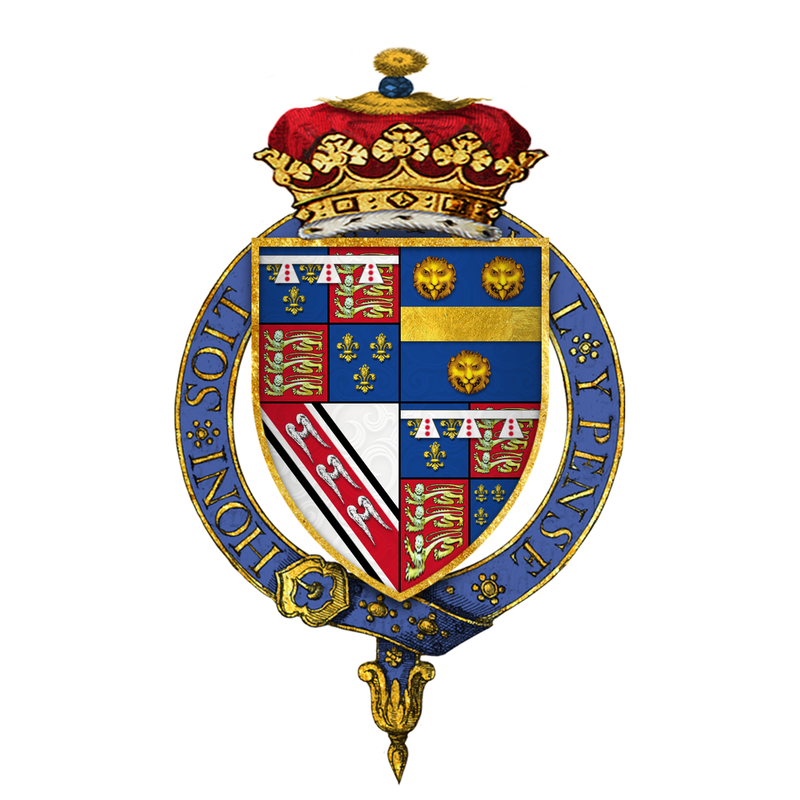 The De La Pole’s were some of the last legitimate Plantagenet’s in England during the Tudor reign. Edmund’s older brother, John, had been named heir apparent by King Richard III after the death of his own son making his the focus of the Yorkists and those loyal to the Plantagenet’s after the death of Richard at Bosworth in 1485. John de la Pole swore allegiance to the new King Henry VII but in 1487 joined the rebellion of Lambert Simnel, who claimed to be the imprisoned Edward, Earl of Warwick and a claimant to the throne. John de la Pole fought and died at the Battle of Stoke which was considered the last battle of the Wars of the Roses. With the death of John the focus moved to Edmund as the claimant of the throne for the Yorkists and in 1491 Edmund inherited his father’s title of Duke of Suffolk although two years later this was demoted to Earl. In 1498 Edmund was indicted in the King’s Bench for allegedly killing a man in a fury. He received the King’s pardon but in summer 1499 Edmund fled to Calais but was persuaded to return to England and returned into the King’s favour. Edmund went on to witness the confirmation of the treaty for Prince Arthur’s marriage to Katherine of Aragon. After a brief trip to Calais with the King, Edmund began hearing that the Holy Roman Emperor would be willing to help anyone that carried the blood of King Edward IV back to the throne so Edmund began to approach the Emperor and after six weeks received word that the Emperor would help him with up to five thousand men for three months. However, the Emperor would not be able to gather these men for his support so instead agreed to lend money to Edmund. On 28th July 1502 Maximillian signed an agreement with the English that in return for £10,000 he would not aid any English rebels regardless of their rank and so Edmund was on his own. On 12th February 1503 with Edmund still staying within Maximillian’s borders, Maximillian was requested to take an oath to swear that he would observe the treaty that he signed and that Edmund would be expelled from his lands. January 1504 saw an attainder passed against the de la Pole’s including Edmund. He eventually left Maximillian’s land during Easter by leaving his brother, Richard, behind as hostage. Edmund headed to Gelderland to the Duke of Saxony where instead of being greeted and supported he was imprisoned. The Duke of Saxony was believed to have received money from King Henry VII to secure Edmund but for some reason he was never handed over to England. Philip, King of Castile, eventually gained possession of Edmund and in January 1506 Edmund sent his servants to communicate with Henry and to negotiate a way to leave Philip’s possession. During January Philip was travelling to Castile when he was blown off course and landed in England. He visited Henry at Windsor where they discussed the surrender of Edmund into Henry’s custody. In March 1506 Edmund was paraded through London and placed into the Tower. King Henry had promised Philip that he would not kill or harm Edmund but instead keep him imprisoned for the remainder of his life. Henry VII kept his word and Edmund was still alive when Henry VIII took the throne. In 1513 King Henry VIII ordered Edmund’s execution and on 30th March 1513 he was taken from his cell in the Tower and beheaded. Edmund was buried on 4th May 1513 in the Church of the Minories, Aldgate.